Images captured with a digital microscope allow you to accurately measure, manipulate and study the subject matter on a much larger scale. Accurate measurements are extremely important for comparing or contrasting one specimen with another, or in industrial quality control decision making. Images or video captured from digital microscopes can be used in reports, presentations, or assessments. They can easily be shared through email, across the web, or in lectures with colleagues or students. Cost savings in the classroom. One digital microscope eliminates the need for one microscope per student because the same image can be viewed by the entire class when it is projected onto a screen. Further, the image can be copied as part of an assignment and distributed to each individual student. Depending on whether you choose a high power digital microscope or a low power stereo digital microscope, each can be used in many fields of scientific study including biology, chemistry, and earth sciences. Low power digital microscopes are used frequently in manufacturing, oil well digging and gemological or dental work. Digital microscopes are relatively inexpensive in comparison with many other types of microscopes and especially in the classroom, limit the amount of parts that might be removed or lost from the microscope (since the camera is built into the microscope system). Digital video microscopes provide the ability to view small parts on large screens thereby reducing eye fatigue. These are extremely useful for Quality Assurance departments and printed circuit board (motherboard) repair or manufacturing. Video microscopes are perfect for any inspection services where constant examination of small parts is necessary. 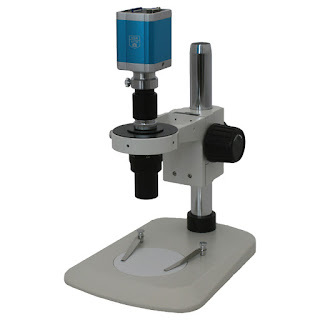 Digital stereo zoom microscopes, also known as industrial stereo microscopes, are preferred by quality control labs and in fields of study such as petrology, gemology, and even numismatics. The focus of these fields is the surface of the object rather than its interior. Whether you are an instructor, a jewelry, a lab technician or a hobbyist, contact Microscope World for assistance in choosing the right digital microscope for your needs.